Very Good hotel and all the required amenities are available at a very reasonable price! I would suggest other at least try once. Hotel staff provides free pickup and drop services to and fro airport for their guest. Overall the service was Good. Also the food qyality is good. I really enjoyed their environment, their well behaviour and hospitality as well as. I think everything is good Except the Price of their food and rent. Very homely feel and amenities met my expectations. I felt very comfortable throughout my 9 days there. Kudos to the staff who were very friendly and accommodating throughout the period of my stay at the hotel. It is a good hotel and you can choose this without hesitation. The staff are very friendly and courteous. They could improve by providing a water boiling pot in the room but they compensated that with excellent service as they served me hot water even in early morning hours when I ordered some. The restaurant food was great. The breakfast is nice. Reception staff, Bakir, Arif and Sohag were particularly nice. They prepared early breakfast for us all three days we stayed there. As the hotel overlooks a lake, there is some problem of mosquitos but the staff promptly attended to the complaint and provided spray and mosquitor repellent plug in device. I strongly recommend for this hotel. The stay was very nice and welcoming. The workers there made it more enjoyable. The names were Bakir, Arif and Sohag. Very well mannered and respectable and we had the option to stay and live here we would. 10/10 I’d recommend. 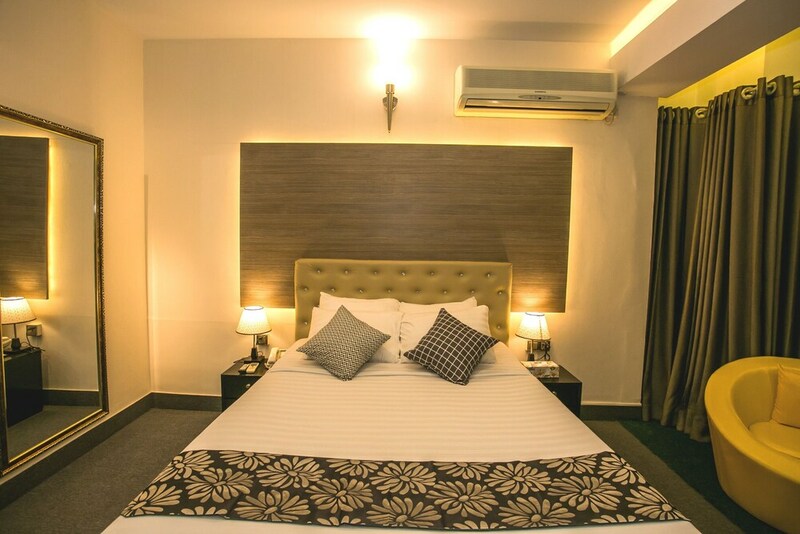 The Tropical Daisy Hotel is very well located in Gulshan, within walking distance of most embassies. It is on a (relatively) quiet road looking out over trees (complete with green parrots) across Banani Lake. The room itself was spacious with a balcony, a comfortable bed and a decent bathroom, all very clean. The desk was small so they brought me an extra table - and a chair for the balcony. The staff were really attentive and friendly. The restaurant was also good, but deserves more users: I was usually in solitary splendour. The hotel arranged for me to be picked up from the airport (I was really grateful for the help in finding my case and handing me over to the driver). I will certainly stay there on any future visits: I enjoyed my stay and everything worked well. Ambience is very good. Food is delicious. Service is also very good. Staff are well trained and well mannered, especially assistant manager Sohel is well behaved and helpful. Overall, it was a wonderful experience to stay over there. An amazing place to stay. The hospitality was great and the senior employees were friendly and outstanding.The complimentary breakfast serves a really good morning for the guests. Keep it up and recommended it hightly!! Hotel Tropical Daisy places you 4.1 mi (6.6 km) from Jatiyo Sangshad Bhaban and 5.5 mi (8.9 km) from Saat Masjid (Seven Domed Mosque). This 28-room, 3-star hotel has a 24-hour fitness center along with free in-room WiFi and free self parking. Free full breakfast is included with your stay and awaits you each morning from 6:30 AM to 11:00 AM. Enjoy a bite to eat at Garden of Eve, the hotel's onsite restaurant. Savor a meal from the comfort of your room with 24-hour room service, or get a quick energy boost at the coffee shop/café. Guests can expect to find free WiFi and 26-inch an LCD TV with cable channels. The bathroom offers a soaking tub and free toiletries. Other standard amenities include a sitting area, a minibar, and free newspapers. At Hotel Tropical Daisy, guests have access to a 24-hour fitness center, free WiFi in public areas, and conference space. You can take advantage of free parking, along with an airport shuttle (available 24 hours) for BDT 20 per person one-way. Multilingual staff at the 24-hour front desk can assist with securing valuables, luggage storage, and concierge services. Additional amenities include a 24-hour business center, coffee/tea in a common area, and a computer station. Free full breakfast is served daily from 6:30 AM to 11:00 AM. Garden of Eve - Restaurant specializing in local cuisine. Open daily. Alfresco dining available (weather permitting). Recreation features at Hotel Tropical Daisy include a 24-hour fitness center. The preferred airport is Dhaka (DAC-Shahjalal Intl. ): 22-min drive, 6.2 mi/10.1 km.